Dhauligiri Hill was a powerful site which transformed the violent streak of Ashoka the Great into the calm and compassionate follower of Buddhism. 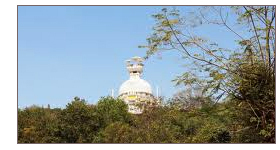 Associated with his remorse and guilt, the then kingdom of Kalinga is present day Dhauli, a major rock edict site in east India, built by Emperor Ashoka. The earliest Buddhist Complex belonging to 1st century AD, Lalitgiri comprises of a major stupas, viharas, sculptures and caves at par with the Buddhist heritage of Ratnagiri. Ratnagiri is another hill preserving in its lap the glorious chapters of Buddhist heritage. The excavations have revealed the traces of two large monastery complexes, a big stupa, Buddhist sculptures, votive stupas and chaityas, etc. The largest Buddhist Complex in Odisha belongs to Udayagiri. The recent excavations in this hillock brought into light a sprawling brick monastery complex, a number of Buddhist sculptures and a brick stupa.